It’s a big jump from Junior Hunter level tests to Senior Hunter level. It’s true that both levels include “marks” — the dogs watch (mark) ducks fall from the sky, and then retrieve them. 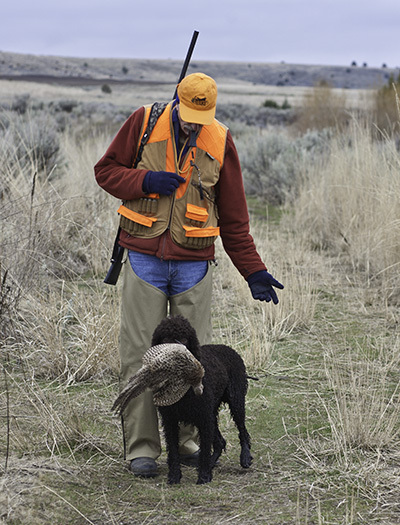 At the Junior level, the dog marks one duck fall, retrieves it, then marks the 2nd duck fall, and then retrieves that one. 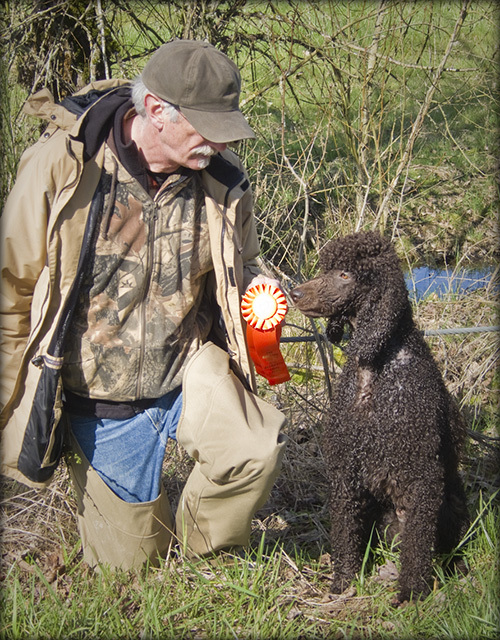 But in the Senior test, the dog is expected to mark two ducks fall, retrieve one (the “go” bird) and bring it back to the handler, and then go out and get the second one (the “memory” bird). 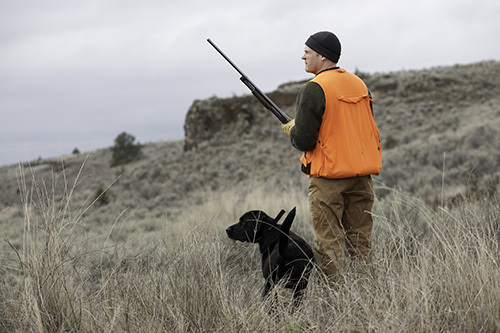 A second major difference is the “blind retrieve.” In that case, the handler knows where the bird is, but the dog doesn’t see it fall. So the handler has to send the dog out to the bird, using whistle and hand signals to tell the dog where to go. A third major difference, especially crucial for high-energy, high-drive dogs like Cooper, is that all this work is done without any collar or leash. That’s not so important while the dog is actually retrieving, but it can be critical when the dog is walking to the start line and waiting at the line for the command to retrieve. The dog has to be under control, and the handler has nothing but his voice, whistle, and hand signals to control the dog. This ties into the fourth major difference: the honor. This is where the dog who has just completed his set of retrieves sits and watches the next dog work. 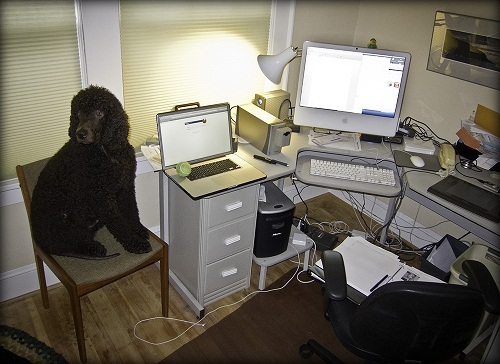 This is so hard for a dog with desire to work or with a competitive spirit, like Cooper. Not being able to do the honor was Cooper’s undoing at his WCX test last October. So here are some videos of Russ and Cooper’s 1st Senior Hunt test. The land series was first, with a 75 yard go bird, a 60 yard memory bird, and a 50 yard blind retrieve. 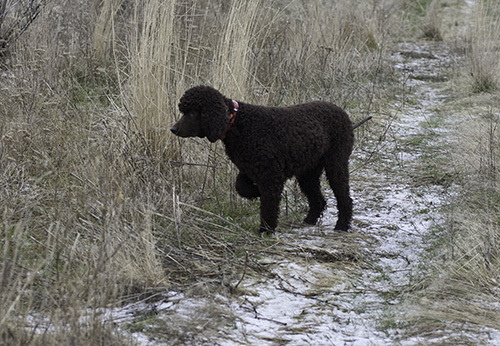 It’s hard to tell from the video, but the land had both reasonably dense cover and shallow bogs, so the dog had hunt in cover and cross shallow water both coming and going. Cooper got all three birds and passed the land series. He actually did better than quite a few of the other dogs out there, going right out to the marked birds and back, with a minimum of hunting around. He succeeded at the blind with only four “handles,” and best of all, he was under control going to the line, during the honor, and leaving the line. All this allowed him to participate in the water series. The water series included a 75 yd go bird, with the dog entering diagonally to the bank (hard for a lot of dogs), a 50 yd memory bird, and then a 70 yard blind. What made this series interesting was that the judges wanted the dogs to go back into the holding blind, carrying their second bird, and there deliver it to the handler. That is an unusual scenario, one that Cooper has not practiced. He got both his marks: the go bird was a nice straight-out-and back. The memory bird was a little squirrelly, but okay. The 70 yd water blind is longer than Cooper has practiced — in fact, he hasn’t practiced any water work since last October. So, wasn’t entirely sure what he was searching for, or how far away it was. He came upon three sticks in the water, and grabbed each one with the idea that this might be what Russ wanted him to get. But at each stick, Russ signaled another “Back!” telling Cooper to keep going. Finally, he got to the duck, picked it up, and brought it back. 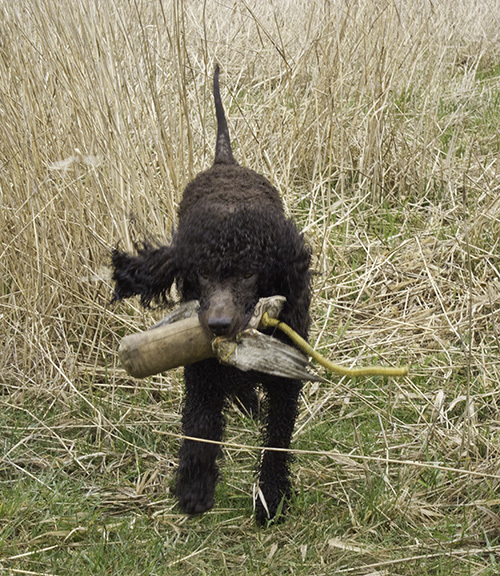 Last weekend, Cooper did a great job being a spaniel, flushing up birds. Today, he was a stellar retriever. Team Cooper passed their first Senior Hunt test and got the orange ribbon. Cooper needs to do that only three more times, and then we’ll be able to add SH (Senior Hunter) to his list of titles. You know how you can’t help yourself when something horrible is happening? You have to watch: car wrecks on the road, scenes of destruction, videos of natural disasters and violence. That’s how I felt last night. 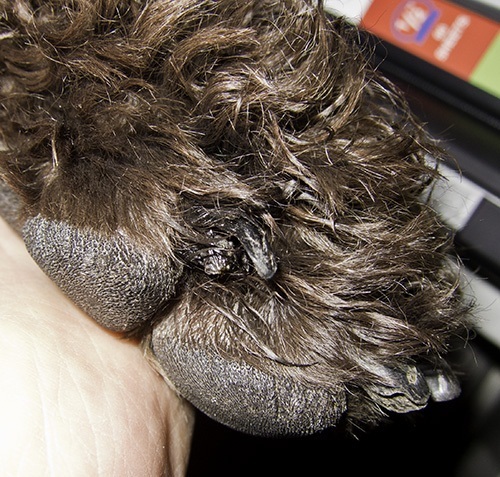 Last night, we noticed that Cooper had begun licking and chewing on one of his toes. That can mean only one thing — another nail is broken or about to break. I got down on the floor to watch. After he was done with that session, I belatedly wished I had had a video camera. It was horrible, and I was fascinated. A nail had indeed split. But the quick must have died awhile ago because his licking and chewing didn’t seem to hurt. He even let me touch the nail briefly. But what was really, horribly fascinating was that he was trying to pull the nail completely off. He’d grab it and pull, but since the nail wouldn’t let go, the nail would pull out of his mouth and his foot hit the carpet with a thud. He did this, over, and over, and over. There’s no video, but Russ did take some pictures. 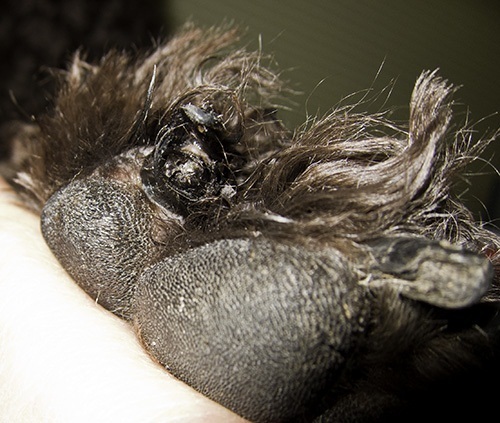 The badly broken nail is on the index toe of his left front foot. You can also see the nail next to it is is hollow and chipped at the tip, splitting along the bottom, and with a gray crumbly quick. I hate this disease SLO. He’s been doing so well for several months. And now this. But is Cooper upset? Or wanting to change his routine? Or putting off the joys of today? No. Put that mouse down, and throw the ball! He’s a real inspiration, that boy. One of the challenges of hunting upland birds is that you need an experienced dog to flush them up. This makes sense — you can’t shoot them until they’re up in the air. Cooper hasn’t had much experience actually finding upland game birds, so of the 6 previous days he’s been out, we’ve spent a lot of time hiking, and not so much actually getting birds. But today, we got a chance to add to Cooper’s repertoire. Due to the wonderful generosity of our friend Norm, we got to go pheasant hunting today on the Sage Canyon Outfitters game preserve, near Maupin, Oregon. Plus, it always helps if the gunner has some experience with a gun, so in the morning, it was my turn to hopefully get some practice, too. Cooper got the point pretty quickly. He found and flushed several birds today, including 5 pheasants and some chukars. And he even got to retrieve a pheasant that Russ shot. Our hunting partners today were Matt and his Lab, Goose. It turns out that Cooper, Goose, Russ, and Matt made a great team. Cooper flushed up the birds, both Russ and Matt shot at them, and then Goose did 3 of the 4 retrieves. It seemed that today Cooper got the memo that his job was to flush up birds — good boy! And he also got to practice “honoring” — sitting still while Goose dove into the grass, sage, or cattails to find the downed birds. Just so I don’t forget, I’ll write that conditions were cool (low 40s) and very windy. In the morning we had a bit of snow on the ground, gray skies with occasional sun breaks to lighten up the CRP (conservation reserve program) land. In the afternoon, we hunted a really pretty little canyon with a stream and several ponds at the bottom, lined with sagebrush, cattails, and tall grass cover. 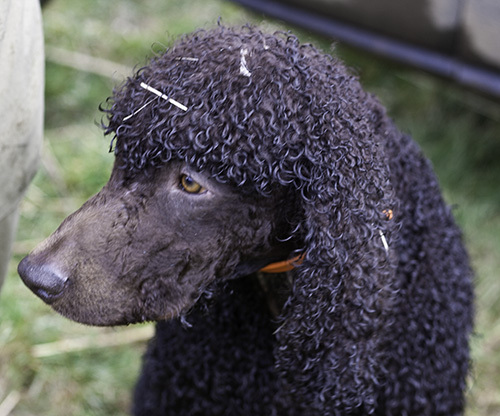 And for Colleen, who gave Cooper his new hunting-friendly hairdo, here’s a picture of the debris he picked up today. Practically nothing, especially compared with this picture, taken on an earlier hunting trip. 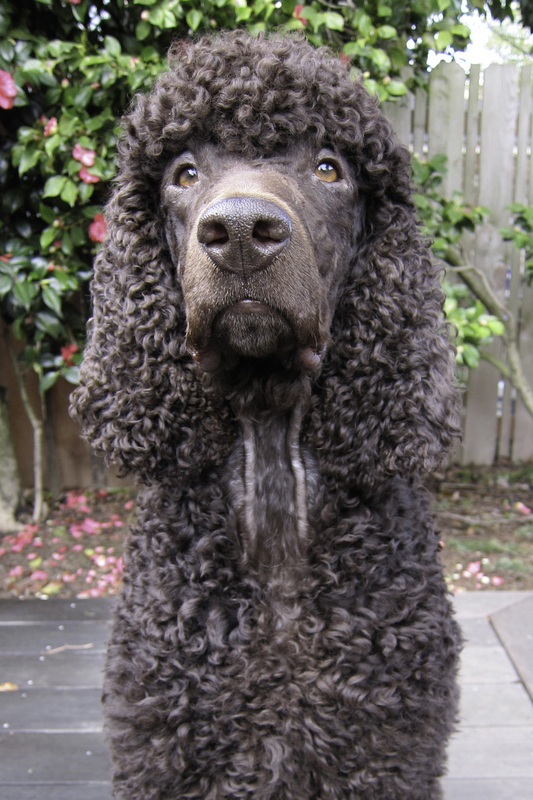 I was so enamored when I saw the pictures of Cooper’s sisters, Darcy and Tosca. I just loved the way that Louise and Pepi have trimmed their topknots and ears. So easy to maintain. So practical for a field dog. So, I wanted to try it on Cooper. Colleen once again agreed to help me out. Actually, she did most all of the work. And I think it turned out pretty darn good. Okay, I get it. Not Russ’s favorite. And I have to admit it was a shock looking at him for the first several days. It’s really different from how he looked for his birthday photo. But it’s growing on me. It’s really growing on me. And the real test will be next Sunday, when he’s out hunting for pheasant and chukar. I’m betting it will be much easier to get out all the debris and mats out of the new ‘do. I’ll let you know what I find out. 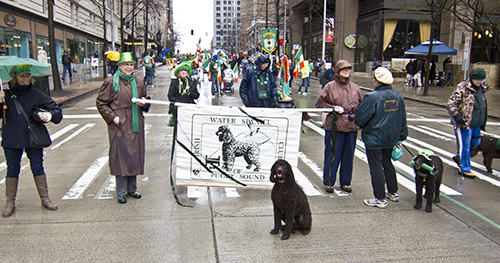 I had had so much fun at last year’s St. Patrick’s Day parade in Seattle that I decided to do it again this year. Of course, no event is ever the same as the prior one. This year we had rain to go along with our clouds. That cut down on the number of Irish Water Spaniels (and their people) who decided to participate. It also reduced the number of spectators. But, on the other hand, this year I had Russ and Cooper with me (they stayed home last year), so that made today’s parade extra fun. And Martha came along with Gromit, who pulled the magical Irish cart, and Pam came, too, to represent the East Coast. 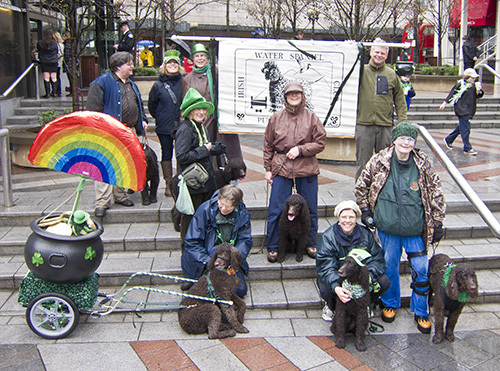 Plus several members of the Irish Water Spaniel Club of Puget Sound: Colleen, Walter, Pam, Mike, and Marsha. It has been a dry couple of months for Cooper, with only land training since duck season closed at the end of January. Finally, temperatures are getting above 50 (it was in the 20s just 10 days ago), so it is suitable for water training. Today, Cooper was looking photogenic in the sun and pretty proud of himself with a duck. So I made yet another photo of my boy. 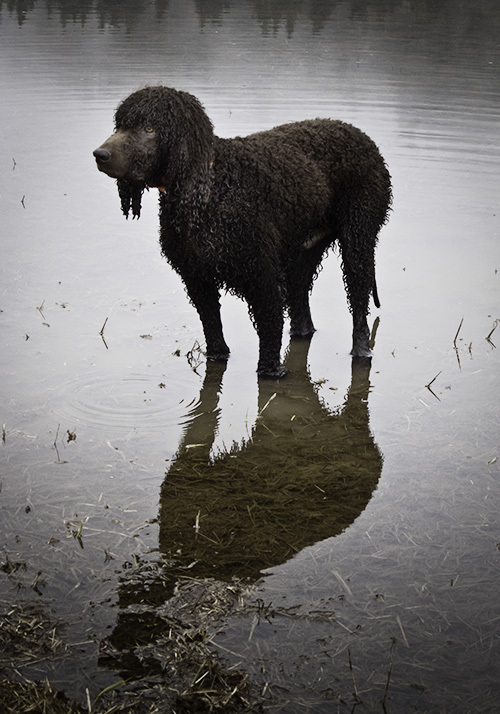 Water training is really important, even when the dog has a solid retrieve on land. Dogs don’t generalize well, so just because he knows how to do something in one environment, doesn’t mean he’ll know to do the same thing in another environment. 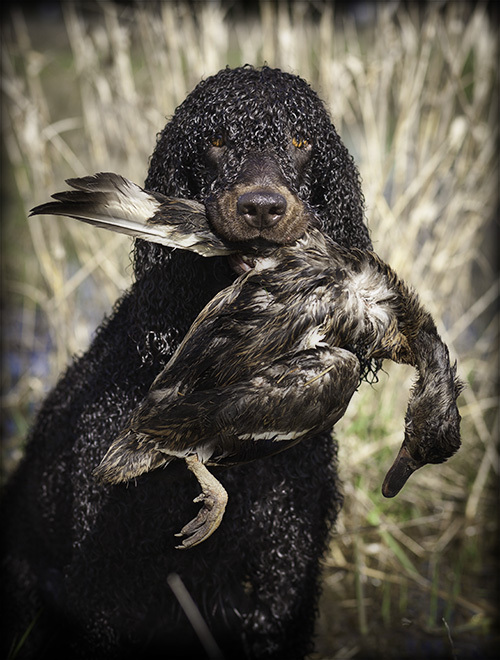 For water retrieves, the dog has to be willing to jump into the water (even when cold or slimy), retrieve the duck, and swim back to the handler with it. Cooper has had water work before, so the basic concept is not completely new to him. Tooey’s a different story. She loves the water and loves to swim, but she hasn’t had the discipline of having to go out into the water, retrieve, and come back consistently. So in just a couple of days she’s going off to California (where it’s sunny and warm) with Butch to do some daily water work. All this in preparation for her first hunt test in just under a month. We will miss seeing our girl every weekend, but it’ll be good experience for her. 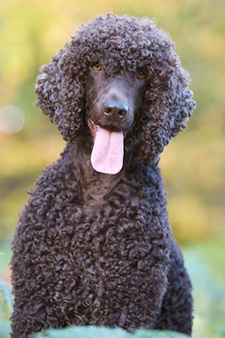 As of March 1st, 2011, the American Kennel Club will allow Irish Water Spaniels to compete in AKC Spaniel Hunting Tests. 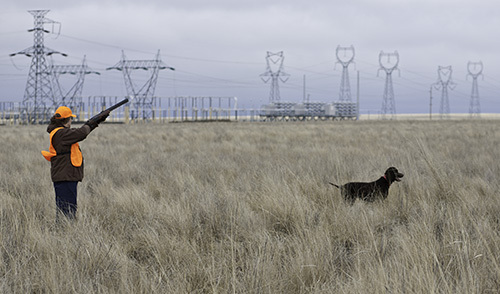 Up until last week, the only AKC-sanctioned hunt tests Cooper could compete in were the Retriever series. Now we have the best of both worlds. Yesterday was a day of retriever training, and we passed a milestone for Cooper and myself. 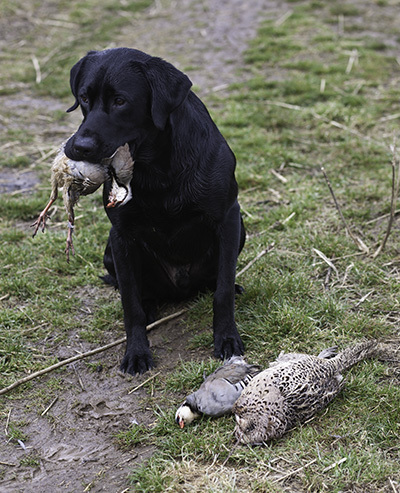 The scenario was a land triple-marked retrieve into moderate cover, averaging about 100 yards each. Then there was a cold blind retrieve. It was in line with the second land mark but with an additional 200 yards, including crossing a ditch with cover and running up a hill (300 yds total). After Cooper ran the triple, I sent him on the blind. He shot out past the old fall and made it to the ditch, where I stopped him with a whistle sit because he was getting off line. With only one back-cast, he turned slightly to the left and went across the ditch and up the hill to find the bumper. Whoa . 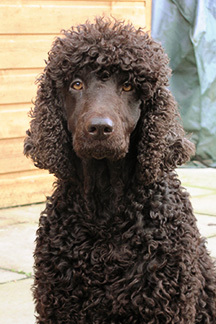 . . who trained this Spaniel to become a Retriever? As you may have read on this blog in the past, this has not been an easy skill for Cooper to absorb. So now that he is becoming a proficient Retriever, it is time to train him to become a Spaniel on command. This morning I took him out, and we threw marks into some moderately heavy cover. No problem. Then we added some sit-to-flush drills. Again, no problem. The next Spaniel drill was to hide bumpers with attached pheasant wings in the cover. I lined him up, pointing him in the general direction, but with the command of “dead hunt.” Off he went like on a blind retrieve, but when he got to area where a bumper was hidden, I called out “go find it.” The Spaniel gene kicked in, the nose went down, and he circled the cover until he came up with the prize. It was a hoot to watch him find, pause, rev the tail up, and lunge. If it had been a live bird, the flush would have been exciting. 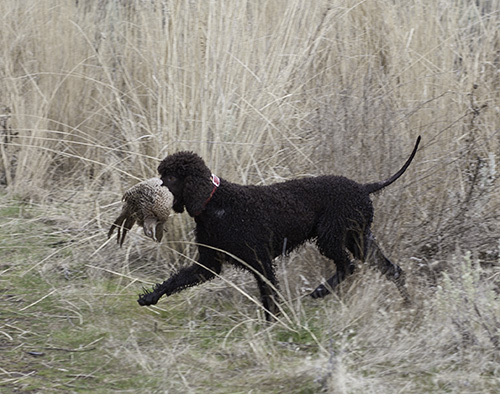 In addition to getting ready for some Spaniel Hunt Tests, we are joining our Boykin friends in two weeks for a late season upland hunt in central Oregon. So we have two weeks to get him reved up to become a hunting Spaniel. And then the following Saturday, Cooper will compete in the season’s first AKC Retriever test (at the senior level). We will see if Cooper’s Spaniel/Retriever brain can keep it all sorted out. Fun will be had for sure, hopefully a few birds, and everything else will be a bonus.